If you are out and about and feel the need, there is better quality coffee now and more available than ever, with coffee shops on every high street. As a place to sit, or a place to talk, coffee shops can be good for community. But behind the scenes, there are competing visions of how coffee shops relate to the local economy. In Totnes, the birthplace of the transition movement, this has erupted in the form of a campaign against national chains. The background is that the South Hams District Council, despite objections, approved an application to build a Costa Coffee in Fore Street in the town. There are already over 40 independent stores selling coffee in town. 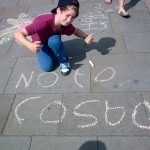 Around one in five people have signed a petition to keep Costa away and this has blossomed into an active and creative campaign No to Costa. Costa Coffee is now a vast and international chain. The company runs nearly 1,400 stores in the UK – making it bigger than Starbucks and Caffè Nero combined – and it plans to double the number of outlets it has over five years. As consumers, we spend half a billion pounds a year in Costa Coffee outlets. But where does that money go? Spending money in a national chain like Costa is like putting an airmail stamp on it, because notes and coins fly out of the local economy – stripped out to fund a centralised business owned by distant investors. Over the last five years, Co-operatives UK has been working in partnership with an inspiring alliance of local food agencies, such as Country Markets, FARMA, Plunkett Foundation, Soil Association and Sustain on a development programme called Making Local Food Work. We have assisted over 400 enterprises over that time through the work we have done on governance and legal advice – and that support is still open for another year. As part of the programme, the charity CPRE looked at the extraordinary economic impact that local food has, through supply chains, employment and consumer loyalty – all meaning that more money is spent locally. In Totnes, they found that over 160 producers supply food and drink outlets in the town, the majority from a circle of five or ten miles away. Local food outlets generate around 300 jobs in store and around 700 jobs at suppliers – in total, ten per cent of local employment. Local sales were worth up to £8 million per annum. Landmatters, for example, is a co-operative using permaculture techniques to farm a rich mix of salads, fruit trees and bushes, supporting local biodiversity. Owens Coffee is an artisan, organic coffee roasters based in South Devon. They have offered the local campaign a hamper of coffee for the best image presented of why Totnes should say no to Costa. My favourite is below.